Ward's willow (Carolina willow) (Salix caroliniana). Ward's willow, or Carolina willow, is a shrub or small tree with spreading or drooping branches, forming an open, irregular crown. Leaves are alternate, simple, 2–7 inches long, narrowly lance-shaped, tip pointed, base narrowed on young leaves, rounded on older ones; upper surface bright green; lower surface white to silvery; young leaves with matted hairs; margin finely toothed; stipules (leaflike structures by the leaf stalks) up to ¾ inch across, with toothed edges. Bark is reddish-brown to gray, checkered, breaking into closely flattened scales. Twigs are slender, yellowish- to reddish-brown or grayish, more or less hairy, becoming smooth. Flowers April–May, male and female flowers in separate catkins, borne on separate plants; catkins slender, narrow, cylindrical, yellow-green. Fruits June–July, capsule about ¼ inch long, egg-shaped or conical, long-pointed, brown when mature; stalk of capsule short, almost absent; seeds tiny with silky hairs at the base that are 2–3 times as long as the seed. 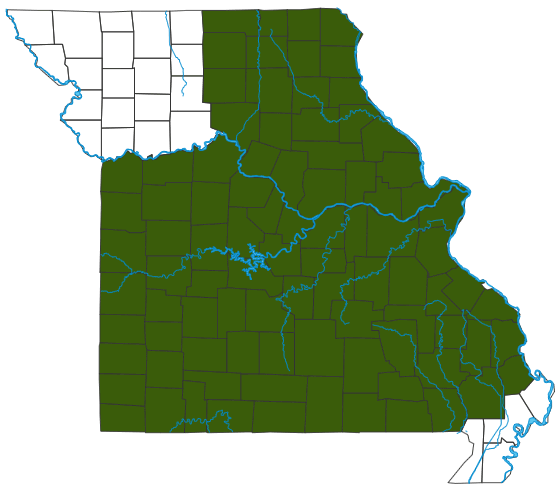 Similar species: Twelve species in the genus Salix have been recorded for Missouri. Ward's willow is one of the most widespread. Occurs along gravel bars, sandy gravel beds, and rocky banks of streams. This is the most common willow along gravel bars in Ozark streams. It is a pioneer species, one of the first woody plants to get established and occupy the outer edges of gravel bars in a stream, thus stabilizing newly formed gravel bars. This flexible willow "bends like a willow" to withstand the force of floods and storms. Mostly statewide. Most common and abundant in the Ozarks. Uncommon to absent in the northwestern quarter and in the southeastern lowlands. Regarding the name, this "pioneer plant" of gravel bars honors an intellectual pioneer, Lester Frank Ward, who was a Civil War veteran, botanist, geologist, paleontologist, and sociologist; he was the first president of the American Sociological Association. In the past, this plant was considered a variety of black willow (Salix nigra var. wardii) and/or as a distinct species, S. wardii. In both cases, it was commonly called "Ward's willow." After it was combined with the Carolina willow (S. caroliniana), many people continued to call it "Ward's willow." This is one of the willow species that is used in the Ozarks for making wickerwork for baskets, furniture, and ornamental pieces. Land managers use this willow along waterways to prevent erosion. Beekeepers are glad for the nectar produced by this plant, which bees make into a high-grade honey. The twigs and leaves are consumed by deer; the shoots and buds are eaten by many rodents, including muskrat and beaver, as well as cottontail rabbits. Some ducks and water birds eat the catkins and leaves. The dense thickets of this willow provide important cover for many animals.